When we announced GHOP, we were excited to perform an experiment to see how many secondary schoolers would be interested in spending a few weeks contributing to open source development. 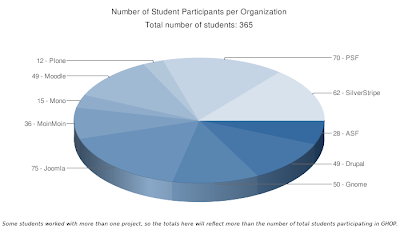 We're pleased to say that the results far exceeded our expectations - over 350 students worldwide came together to complete nearly 1,000 tasks to help improve open source. You can learn a bit more about the results of the contest from these charts; just click on the image to enlarge it. Many thanks to Pawel Solyga for creating these charts for us. We've spent the last week corralling our colleagues from the ten participating free and open source projects and today we're pleased to announce our ten Grand Prize Winners, each of whom will receive a trip to Google Headquarters in Mountain View, California, USA later this year for an Awards Ceremony and day of FLOSS and fun, Google-style. Our winners hail from all corners of the globe, from the West and East Coasts of the United States to Poland, South Africa and Thailand. One final note, we heard nearly universally from the projects participating that choosing a Grand Prize Winner was quite difficult for them. In most cases, all of their student participants completely exceeded their expectations and produced work of amazingly high quality. We want to extend our thanks and congratulations to all participants in GHOP. We look into featuring the stories of some of these "runner up" students on this blog in the coming weeks, so stay tuned for more news. Congratulations to all our Grand Prize Winners, and many thanks to their mentors for helping us make GHOP possible!